A sharp-looking axe with a full-scale maple neck, dual humbuckers and TOM bridge. 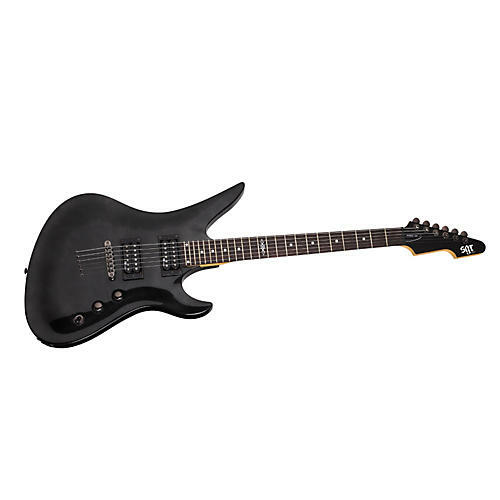 The SGR Avenger Electric Guitar has the design and features of Schecter guitars costing much more. The double-cutaway body is made of basswood with beveled edges for playing comfort. Its bolt-on maple neck has a rosewood fingerboard with 24 medium frets and an intricate Gothic Cross inlay at the 12th fret. SRG humbucking pickups and a Schecter tune-o-matic bridge offer the tones and sustain that make this guitar an exceptional value. Comes with a Schecter gigbag. Grab an affordable electric guitar that looks and sounds great. Order today.